Author(s) Ledger, William; Schlaff, William D.; Vancaillie, Thierry G.
Pain is among the foremost complaints of women seeking gynecological consultation, yet the diagnosis is often limited to endometriosis. Chronic Pelvic Pain discusses how to diagnose a broad scope of underlying conditions presenting in relation to pelvic pain in women and their treatment. 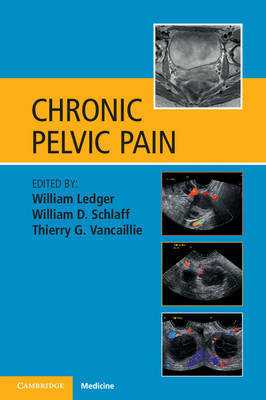 Starting with an anatomical review from a pain point of view, several chapters continue to explore specific conditions such as vulvodynia, the often overlooked painful bladder syndrome and pelvic inflammatory disease. Also covered are topics such as sexual dysfunction, psychological aspects of chronic pelvic pain and alternative treatment methods. Practical treatment tips for specific conditions which are readily applicable in everyday practice are provided throughout. Special attention is given to the use of sonography and MRI in diagnostics. With its comprehensive approach, addressing both body and mind, this is essential reading for medical specialists and consultants and specialist medical trainees in gynecology, pain medicine, and family practice.